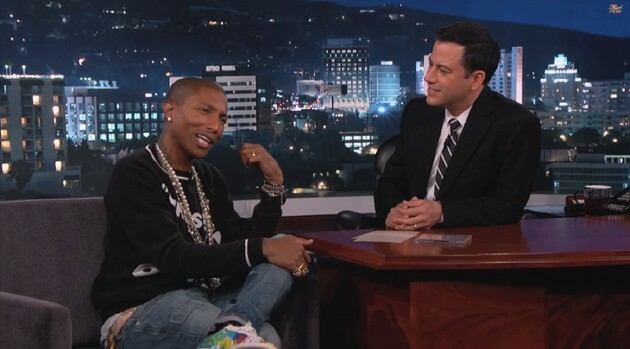 ABCOn Wednesday night’s Jimmy Kimmel Live!, Jimmy welcomed Pharrell Williams. The award-winning producer admitted to Kimmel to being shocked by the success of his hit “Happy,” the video of which features none other than the chat show host. As one would imagine, somebody with Williams’ resume would have some stories to tell, and he didn’t disappoint with a story about the first time he heard from Michael Jackson. Pharrell explained he was in the studio with Justin Timberlake recording “Girlfriend” when someone told him to pick up the phone, because MJ was on the line. Williams didn’t believe that Jackson was calling him and he hung up on the king of pop, not once, but twice. Williams also extended best wishes to Miley Cyrus, who was recently hospitalized for an allergic reaction. Williams and Cyrus worked together on her Bangerz album and he told Kimmel the experience left him wanting to work on a full-on country record.